Part 1 Advances in apparel design: Measuring and predicting fabric and garment drape; Computer aided colour matching of apparel fabric; Computer-assisted yarn design; Improving apparel sizing and fit; Three-dimensional body scanning to improve apparel fit; Computer-assisted garment design using three-dimensional body models; Computerised pattern making in garment production. Part 2 Advances in apparel production: Advances in apparel product development; Developments in apparel knitting technology; Technological advances in sewing garments; Digital printing of textiles for improved apparel production; Developments in pressing technology for garment finishing; Automated fabric inspection. Apparel production is a complex process often involving an international supply chain which must respond rapidly to the changing needs and tastes of consumers. This important book discusses the technological improvements which are transforming the speed, flexibility and productivity of the industry. The first part of the book reviews advances in apparel design. There are chapters on modelling fabric and garment drape, computer-aided colour matching, yarn design and pattern making. Other chapters discuss key issues in apparel sizing and fit, and the role of 3-D body scanning in improving garment fit and design. The second part of the book surveys advances in production, beginning with product development before looking at advances in knitting, sewing, printing, finishing and fabric inspection. 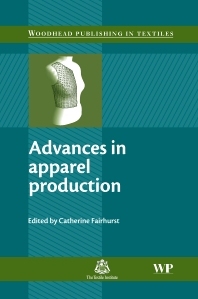 With its distinguished editor and international team of contributors, Advances in apparel production is a standard work for those researching and working in this important industry. Dr Catherine Fairhurst is the Head of the Department of Clothing Design and Technology at Manchester Metropolitan University, UK. Dr Fairhurst is internationally-known for her research in apparel design and production.